Our cutting edge research and alternative manufacturing methods deliver the most color neutral ND filter for the discerning landscape photographer. In the time that it took us to achieve the X4 ND’s unparalleled color neutrality we also took our hand at redesigning the filter frame from the ground up. The X4 ND features SCHOTT Superwhite B270® optical glass, which is an ultra clear crown glass. It is produced by melting high purity raw materials and then made using the continuous draw process. The result is excellent transmission in the ultraviolet, visible, and infrared spectrums, and a high surface quality that accepts our state-of-the-art MRC and nanotec® coatings exceptionally well. Our state-of-the-art multi-resistant coating (MRC) is an optical coating applied to both surfaces of the glass disk to reduce reflection and to increase surface durability. Our proprietary MRC coating is structurally harder than the glass itself and the reduced reflections improve the efficiency since less light is lost. The reduction of reflections also improves the contrast of the image by elimination of stray light. The real world result? Better contrast and color. We specifically designed the X4 ND as a workhorse ND filter for field work, built to withstand extreme wind, salt water, dust and other abrasive conditions and elements. The X4 ND incorporates our state-of-the-art nanotec® Nano Coatings Technology, which beads water and other elements rather than absorbing and smearing. We stand behind each X4 ND filter with our 25 Year Ironclad Guarantee with US-based phone, email and live chat support. How does poor quality MRC affect image quality? “It is a truly rare happening when I run across a product and can’t seem to find anything negative to add in the review. In the course of bringing you an unbiased and honest commentary I usually find some minute problem which I feel is worth sharing. Worlds Most Color Neutral ND Filter. 100% Guaranteed. Most of the neutral density filters on the market exhibit a strong blue or magenta cast. The higher the ND factor the more pronounced the color cast. To achieve the most color neutral ND performance we had to develop an alternative manufacturing method to the conventional oven process. Traditionally ND filters are manufactured by baking glass at high temperatures and then grinding it down to desired dimensions. In our experience manufacturing the X2 ND (which uses the traditional method), very color neutral results can be achieved if state-of-the-art equipment and raw materials of the highest purity are used, but the consistency of the color profile is not as precise as coatings technology. “There is absolutely nothing bad to say about the quality of this filter; it is really exceptional. The SCHOTT® B270 glass is wonderful, and the brass metal construction gives a great, high quality feel to the unit. Transmission spectrum using scan speed of 1200 nm/min at 2.00nm resolution. Analyzed on a Hitachi U-4150. Spectrometers are optical instruments that can detect spectral lines and measure their wavelength or intensity. Spectrometers can also be used to test the efficiency of an optical filter in order to determine whether a filter has properly blocked or transmitted specific wavelengths. A perfectly flat transmission curve would yield a perfectly color neutral result. And while there is no such thing as a perfectly neutral ND filter (contrary to a filter manufacturers claim) the X4 ND is the most color neutral and has the flattest transmission curve of any ND filter, guaranteed. 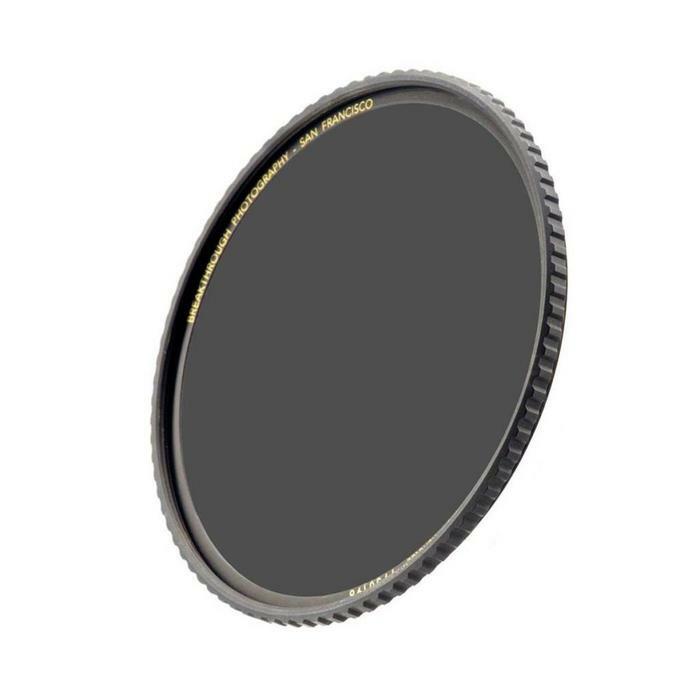 Neutral density filters manufactured using the traditional method also have strong transmission in the infrared wavelength starting at 700nm, whereas the X4 ND maintains a very well controlled and flat transmission all the way throughout the visible spectrum and into IR. A breakthrough design with traction. During the period of time that it took us to achieve the best color profile performance we also redesigned the filter frame from ground up. Constructed of high quality brass CNC machined with our signature traction frame, the X4 ND is easier than ever to attach and remove securely, even with gloves on in cold conditions. We specifically designed the X4 ND be a workhorse ND filter for field work, built to withstand extreme wind, salt water, dust and other abrasive conditions and elements, and we guarantee each X4 ND to perform with optimal clarity and color neutrality for 25 years even in the harshest of conditions. Register your X4 ND serial number online in minutes to activate your 25 Year Ironclad Guarantee. Our US-based support team is available by phone, live chat or email. We stand behind each X4 ND to be free of defects in craftsmanship for 25 years, but they’ll easily last 50+ with proper care.